Beckman Institute Postdoctoral Fellows Dan Kleinman and Fan Lam will present their research at the final Director’s Seminar of the spring semester beginning at noon, Thursday, May 3, in Room 1005 Beckman. Kleinman will talk about “What’s in a Word? Electrophysiological Correlates of Word Selection during Language Production,” and Lam will discuss “Ultrafast Magnetic Resonance Spectroscopic Imaging of the Brain.” The lecture is open to the public, and lunch is provided. Although electroencephalography (EEG) has long been used to study how people comprehend language, researchers have only recently begun using it to study how people plan words for production. To date, virtually all such studies have used picture naming paradigms, which require a single correct response on each trial and involve word planning devoid of context—two features that are uncharacteristic of natural speech. In this talk, I will discuss our recent work investigating the time course of word production using a sentence completion task (“A dog has a good sense of …”), which provided speakers with a rich semantic context and afforded them flexibility in what to say (“… smell,” “… hearing,” “… humor,” etc.). By measuring speakers’ brainwaves as they engaged in word planning, we were able to assess how quickly we could detect various properties of to-be-produced words, such as response latency and word frequency. In addition, we used speakers’ own productions as a window into their long-term semantic memory network, allowing us to predict how they would respond to different linguistic stimuli based on things they said. Implications for models of language production and comprehension will be discussed. Dan Kleinman earned a B.A. in linguistics and cognitive science from Pomona College in 2006, and a Ph.D. in psychology and cognitive science from the University of California, San Diego, in 2013. 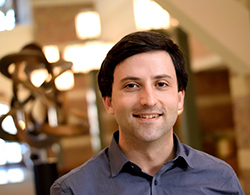 He is currently a Beckman Institute Postdoctoral Fellow. His research uses behavioral experiments and electrophysiological methods to study how people decide which word to say next, how bilinguals switch back and forth between languages, and the relationship between speaking and attention. Brain mapping is one of the most exciting frontiers of contemporary science. While recent rapid development of neuroimaging technologies has enabled the visualization of detailed structural and functional organizations of the brain, molecular imaging of the brain has been a dream of many scientists and medical practitioners for several decades. Most existing molecular imaging techniques require introducing exogenous probes into the subject, limiting their in vivo translation. Magnetic resonance spectroscopic imaging (MRSI) has long been recognized as a powerful label-free molecular imaging tool. However, clinical and research applications of MRSI have been developing slowly due to several fundamental technical hurdles, including slow imaging speed, poor spatial resolution, low sensitivity, and overwhelming nuisance signals from tissue water and lipids. In this talk, I will discuss our recent progress in tackling these challenges using a subspace imaging framework integrating novel signal generation, machine learning, and advanced image reconstruction strategies. These developments have led to an ultrafast MRSI technology offering an unprecedented combination of speed, resolution, and signal to noise ratio (SNR), with more than an order of magnitude improvement over any existing method. Future development of this new technology and potential applications in addressing important clinical and neuroscience questions will be discussed. Fan Lam earned his B.S. degree in biomedical engineering from Tsinghua University, China, in 2008, and his Ph.D. degree in electrical and computer engineering (ECE) from the University of Illinois at Urbana-Champaign in 2015, where he is currently a Beckman Institute Postdoctoral Fellow. His research focuses on developing advanced magnetic resonance based neuroimaging technologies and their applications to the study of brain functions at normal and diseased states. 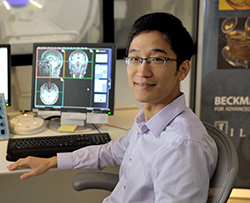 Lam is a recipient of several awards, including the Junior Fellow Award from ISMRM (International Society of Magnetic Resonance in Medicine), the Best Student Paper Award from ISBI 2015 (International Symposium of Biomedical Imaging), a Beckman Institute Graduate Fellowship, and the Robert T. Chien Memorial Award from ECE at Illinois. Lam has accepted a faculty position with the Department of Bioengineering at Illinois, which will begin this fall.